This unique pro-life pamphlet is designed to reach those who consider themselves to be followers of Jesus. The message of this product is that silence is not slaughtering of thousands of innocent babies. 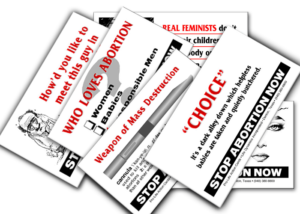 The question is: how many people love their neighbors enough to share the truth with them about abortion? If you’re a person who does, then this pamphlet is perfect for you! Share it with your fellow brothers and sisters in Christ, and your minister, priest, or pastor. Speak up for the innocent children!